Dodder River and Bushy Park - 9th April 2017. 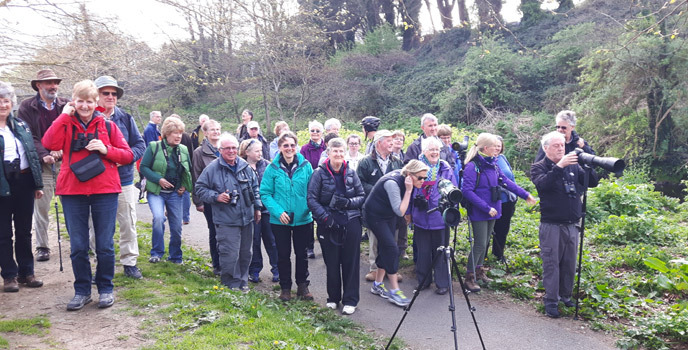 South Dublin Members on our April outing to the Dodder River and Bushy Park. Picture by Eleanor Keane. 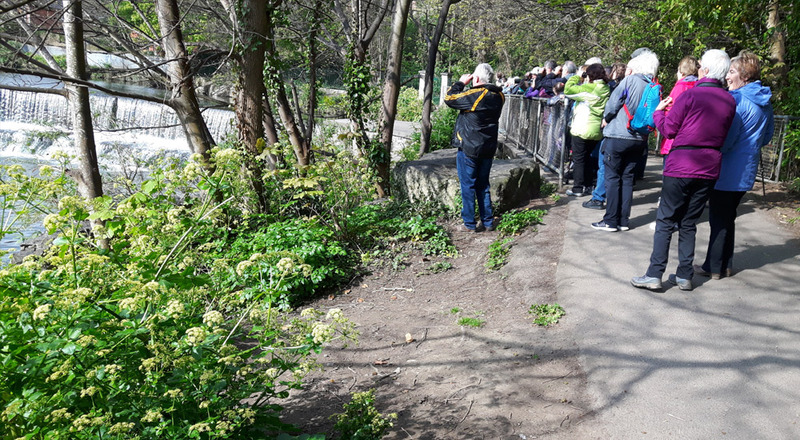 On a beautiful April morning 55 people and some interested children gathered at the Dropping Well pub for the South Dublin Branch outing to the River Dodder and Bushy Park. When I first started going on BirdWatch Ireland branch outings, Bushy Park was a regular venue. So it was great for me to see our members back in the area after such a long absence. In those days our leader was the late Maurice Bryan. 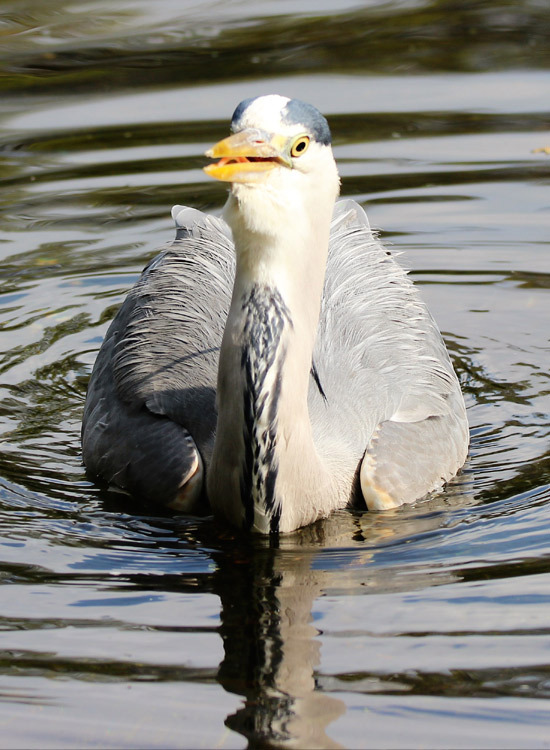 Maurice was local to the Dodder and Bushy Park and had great depth of knowledge of the area. He used to write a short newsletter for the branch called Dodder Diaries. On this occasion, branch Chairman Frank Doyle, was leading and he also is very knowledgeable of the birds of the area. 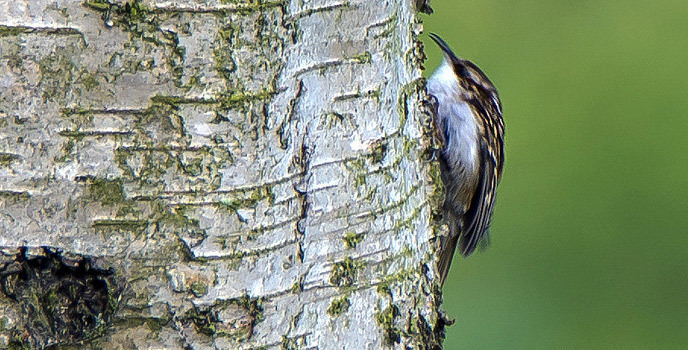 A Treecreeper makes it way mouse-like up the bark of a tree. Picture by Brian Tansey. Our first treat of the day was to hear the sweet song of the Blackcap, one of the three migrant warbler species we were hoping to see on the walk, the others being Chiffchaff and Willow Warbler. Later we got brief glimpses of the Chiffchaff and head it calling from high in the tree canopy. The Chiffchaff and Willow Warbler can be difficult to tell apart unless you know their call. The Chiffchaff has darker legs and is the more active of the two, the Willow Warbler’s legs are usually brown. Unfortunately no Willow Warbler on this occasion. 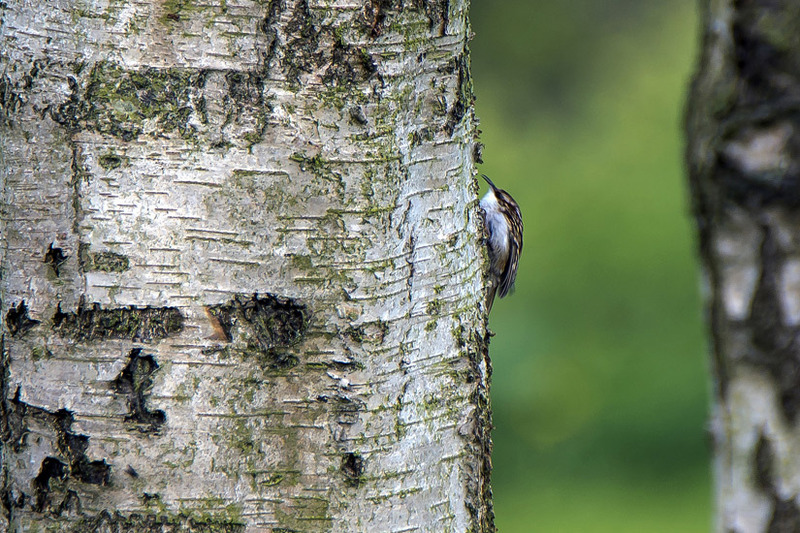 Then someone shouted Treecreeper and there it was close by on a Birch tree creeping up the tree like a mouse. They climb to the top of the tree and then fly to the bottom of the next tree picking out insects from under the bark as they climb. 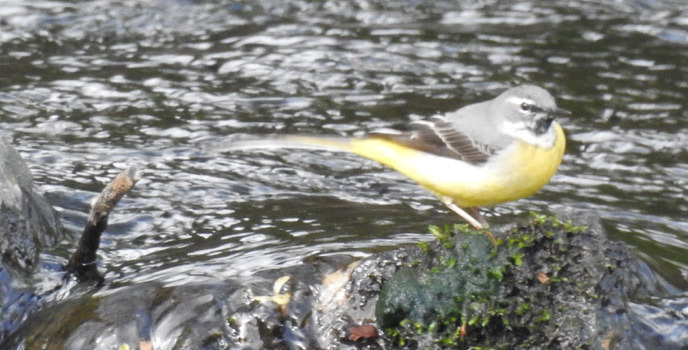 Grey Wagtail on the River Dodder. Picture by Gustavo Zoladz. We then saw our first target bird for the day the Grey Wagtail. You would be forgiven for thinking that this bird was the Yellow Wagtail because calling it grey I always think does it an injustice. Frank explained that the Yellow Wagtail is much yellower than the Grey, and also explained the difference between it and the Pied Wagtail. 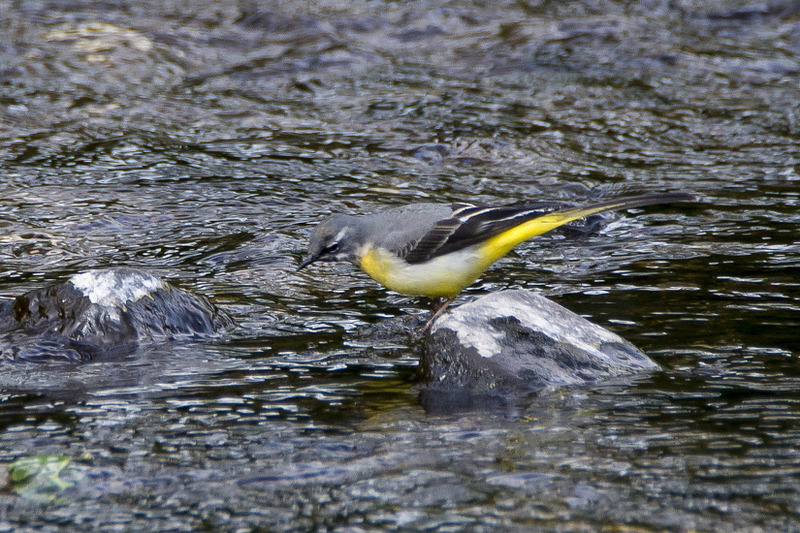 The Grey Wagtail is usually found near rivers and the Pied Wagtail on stony ground like car parks and farmyards. We walked on towards Dartry Park enjoying the wonderful scenery this area has to offer, listening to the numerous Wrens serenading us and intoxicated by the perfume of the Alexander that grows all along the riverside. 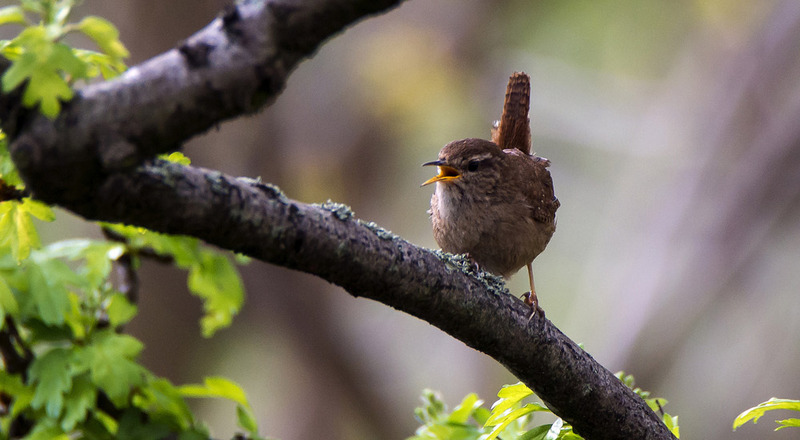 What a wonderful song the Wren has for such a small little bird. 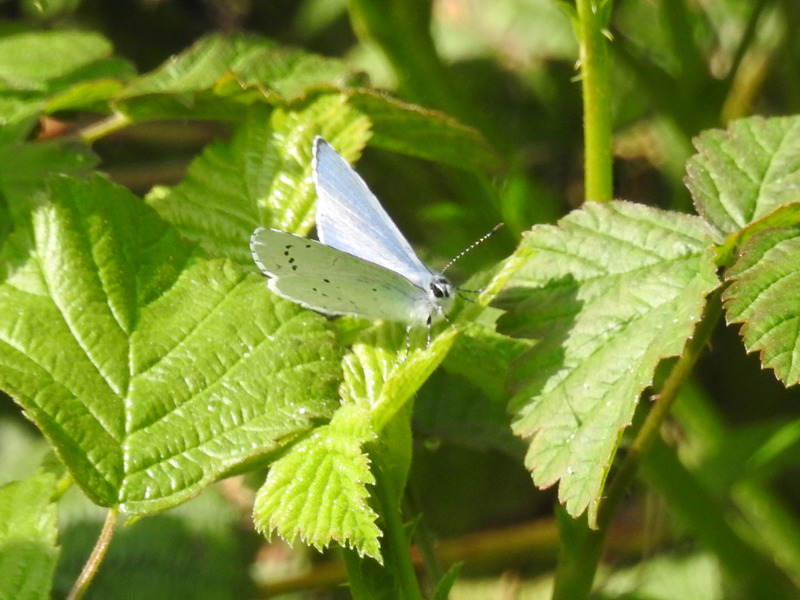 We also saw one of the first butterflies of spring the Holly Blue and also Orange Tip. We then had fleeting glimpses of a pair of Bullfinch as they flew across the river into some shrubbery. 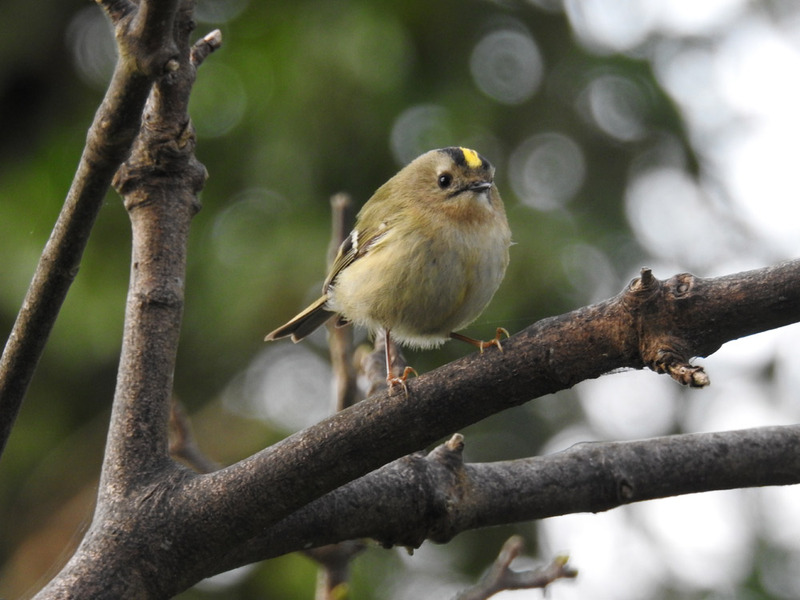 We had good views of Goldcrest, Ireland’s smallest and busiest bird and can be difficult to see. 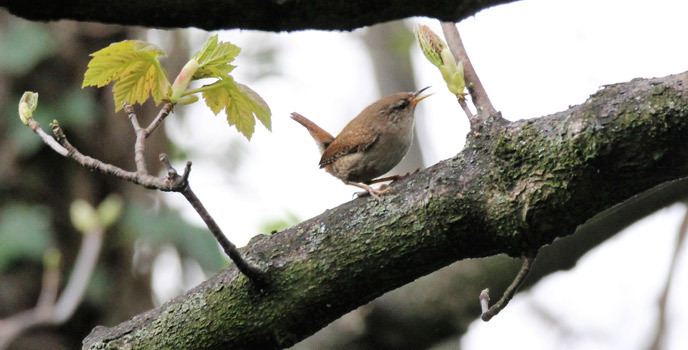 Wren, a small bird that can make a big noise. Picture by Hilary Nic Íomhair. 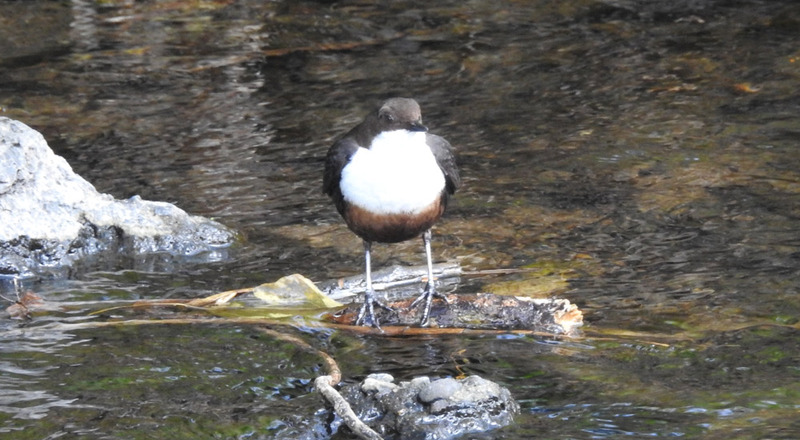 Dipper another of our target birds for the day, gave great views especially for the photographers amongst us as it stood on a stone in the middle of the river bobbing up and down. 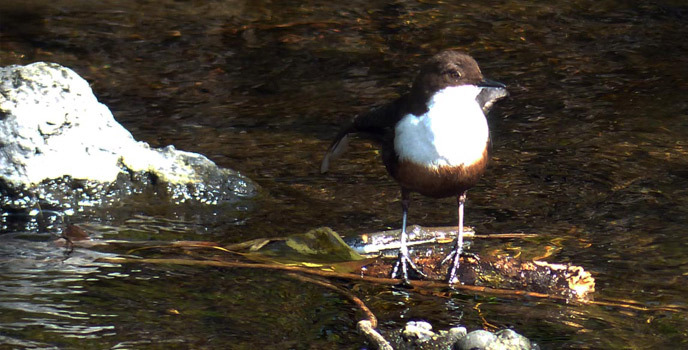 These river birds are an indicator species, their presence indicate clean rivers with plenty of food, such as Caddis and May-fly larvae. It perches on rocks in the middle of the river and dives under the water to catch the larvae. One would wonder how it doesn’t get washed away in the fast flowing river. It has long toes and strong claws which allow it to grip strongly as it walks along the stony river bed. The bird has high haemoglobin levels in the blood enabling it to store large amounts of oxygen on underwater dives. It also has nictitating membrane which it draws across its eye to protect it while under water. 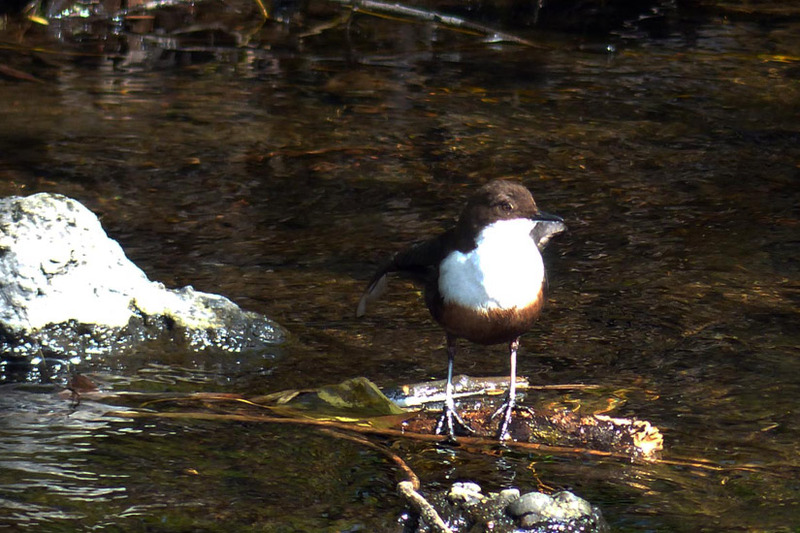 Dipper, the most aquatic of passerines. Picture by Bill Quinn. Eleanor was lucky enough to see a flyby of a Kingfisher. I have not seen them this year in this area as frequently as last year and wonder why. Perhaps they have relocated up or down river. On we walked to our last stop of the day the duck pond in Bushy Park. There we saw Mute Swan, Mallard and Tufted Duck, Little Grebe, Moorhen, and Lesser Black-backed Gulls. Unfortunately we did not have time to go the wooded area but it is well worth a visit. You might be lucky enough to see a Sparrowhawk or go there in evening light when it is truly magical. There is also a heronry a little further up-stream, and can usually be located in breeding season by the squabbling of resident Grey Herons. Grey Heron close encounter in Bushy Park. Picture by Hilary Nic Íomhair. Some more pictures taken on the day by Hilary Nic Íomhair, Gustavo Zoladz, Eleanor Keane and Brian Tansey. 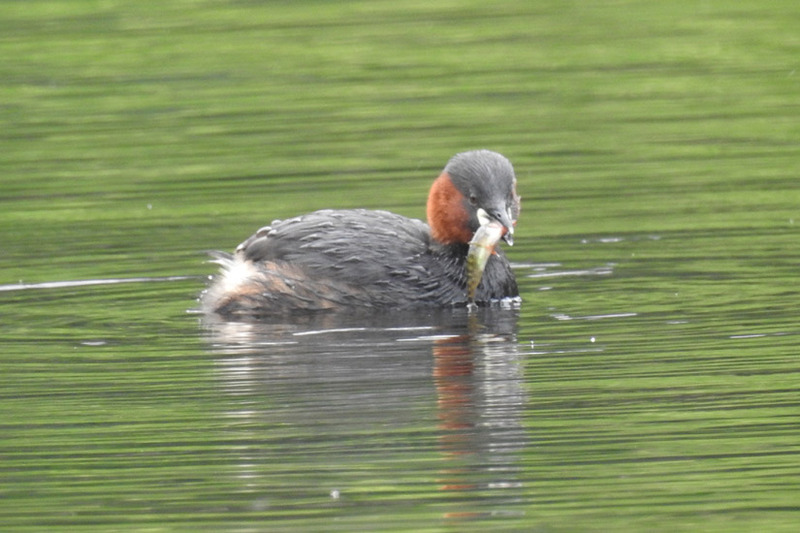 Little Grebe mealtime in Bushy Park. Picture by Gustavo Zoladz. 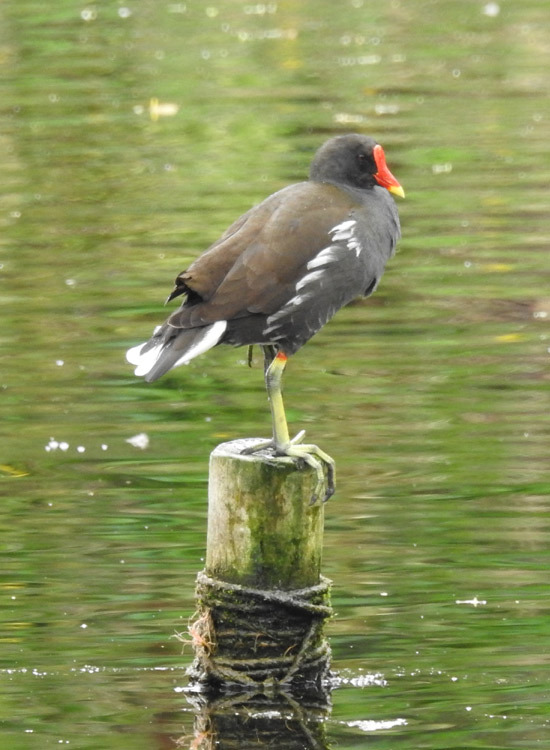 Moorhen finds a vantage point in Bushy Park. Picture by Gustavo Zoladz. 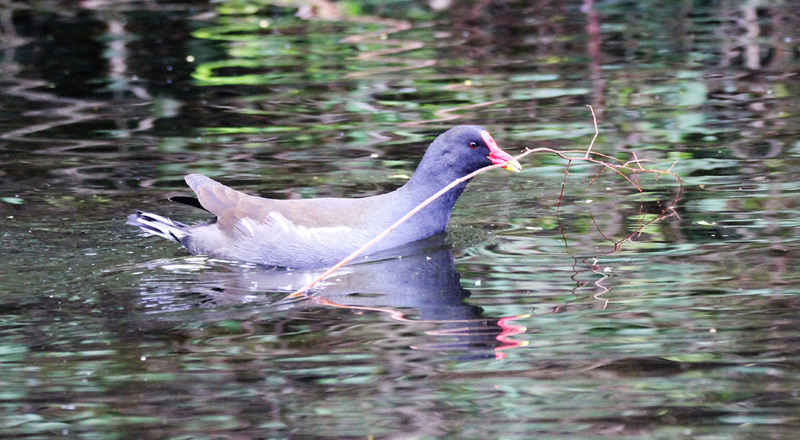 Moorhen carrying nest material in Bushy Park. Picture by Hilary Nic Íomhair. 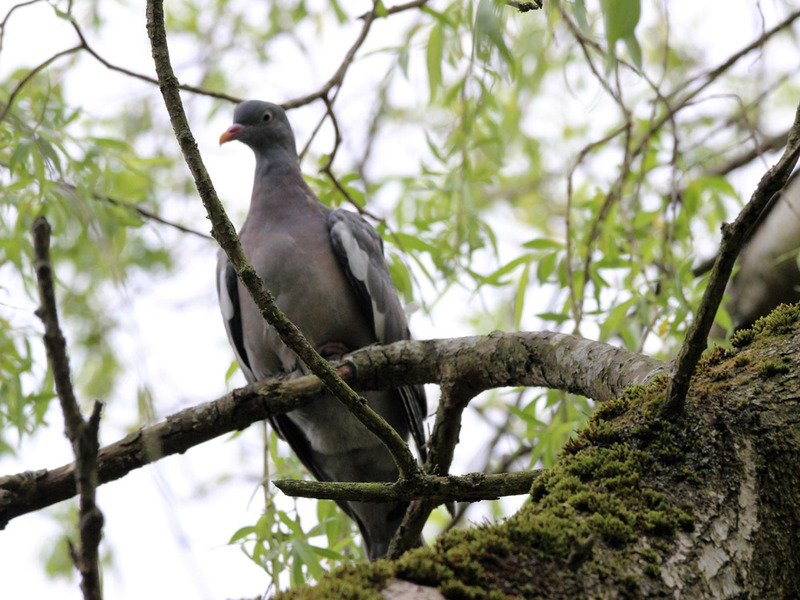 Woodpigeon looking down from high above the Dodder walk. Picture by Hilary Nic Íomhair. 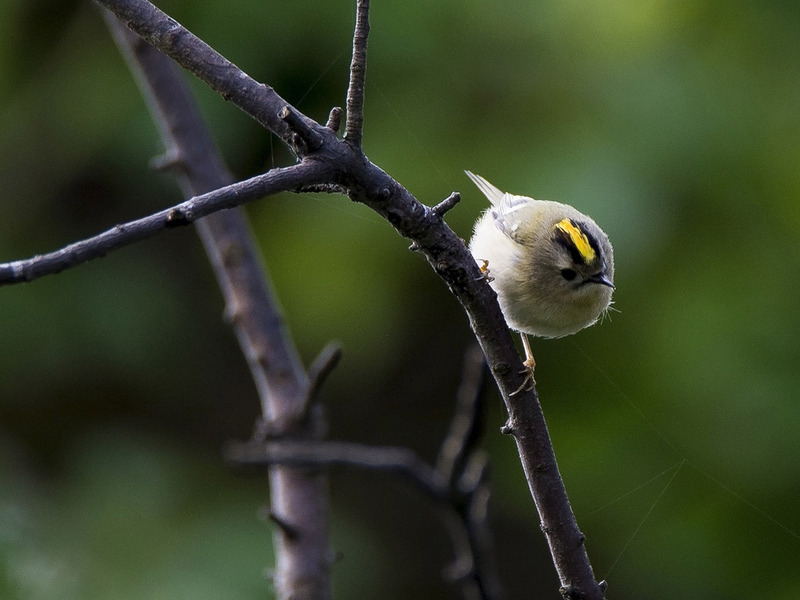 It's a big world for a tiny Goldcrest. Picture by Gustavo Zoladz. Goldcrest sliding across a spider's web. Picture by Brian Tansey. 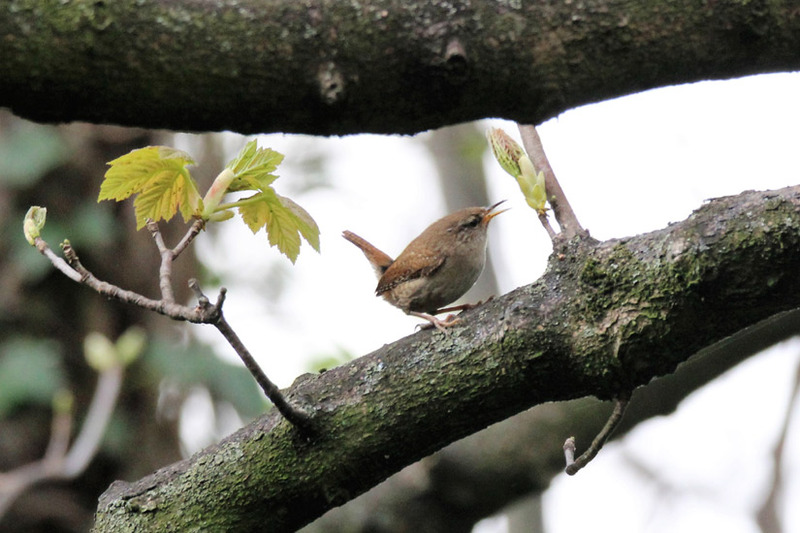 Wren along the Dodder walk. Picture by Brian Tansey. 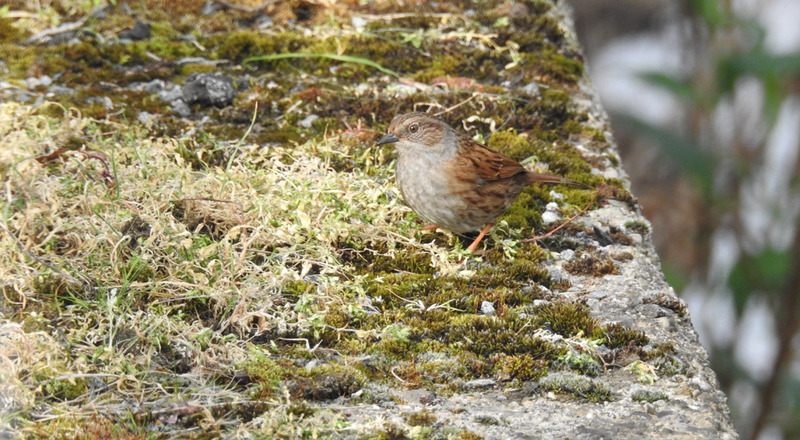 A Dunnock notices some passers by. Picture by Gustavo Zoladz. Dipper looking straight ahead and ... Picture by Gustavo Zoladz. 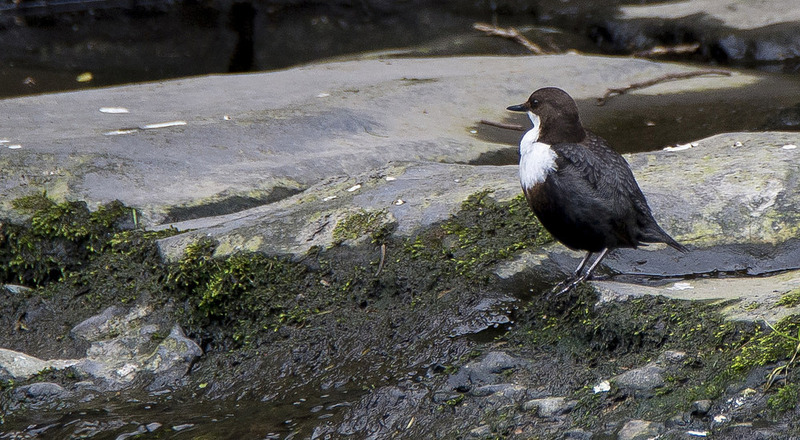 ... Dipper looking to the left. Picture by Brian Tansey. 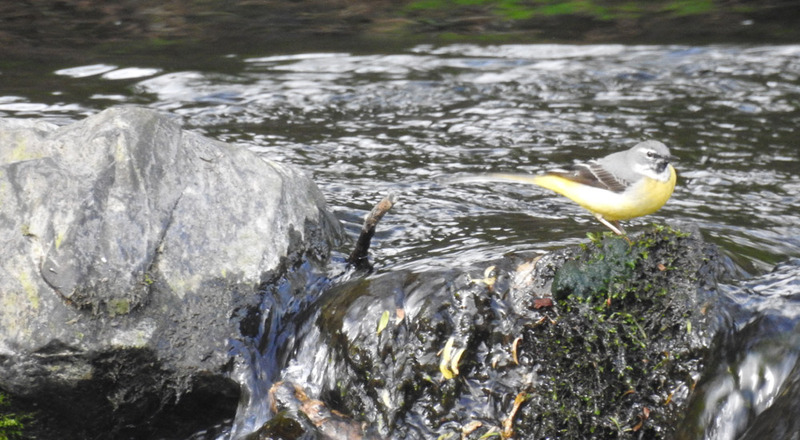 Definitely a Grey and not a Yellow Wagtail on the Dodder. Picture by Brian Tansey. Holly Blue butterfly. Picture by Gustavo Zoladz. 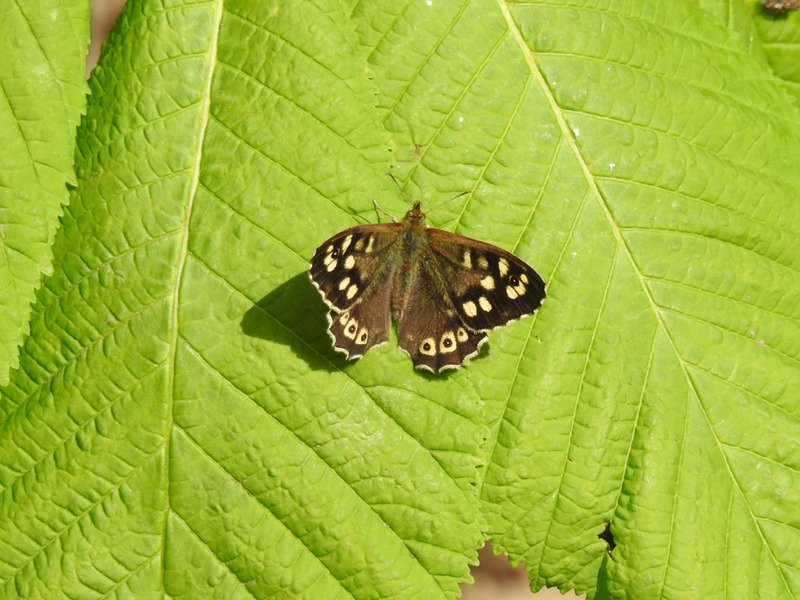 Speckled Wood butterfly. Picture by Gustavo Zoladz. 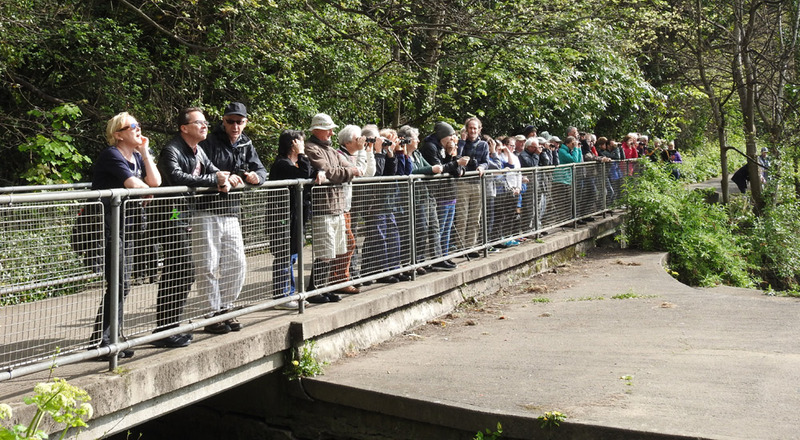 South Dublin members at one of the River Dodder weirs. Picture by Eleanor Keane. 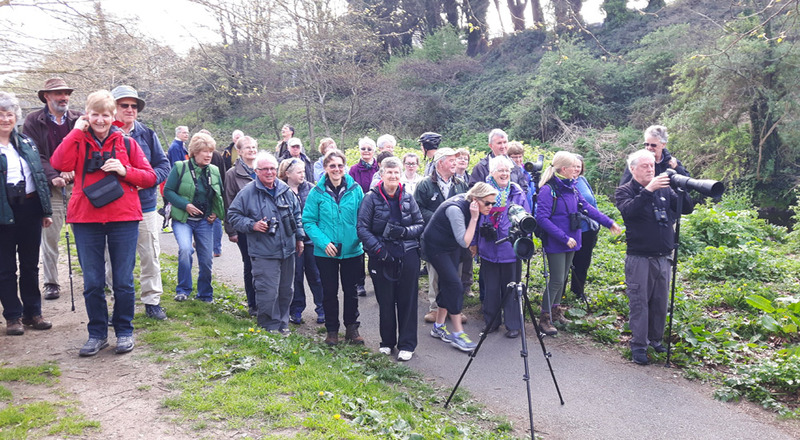 South Dublin members birding on a Sunday in April by the River Dodder. Picture by Gustavo Zoladz. 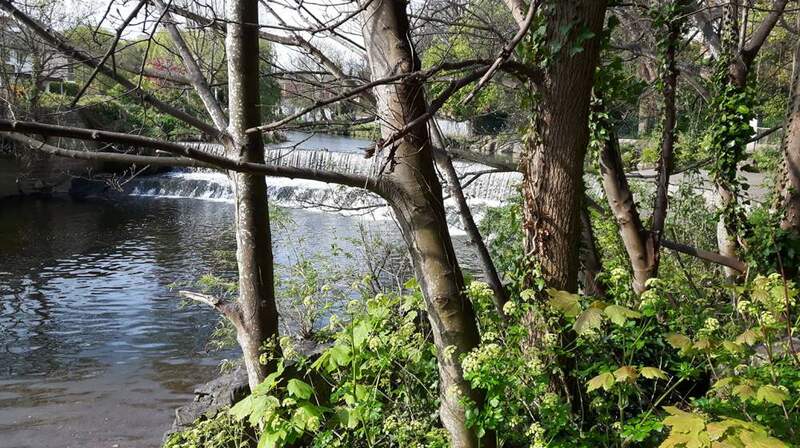 A view of one of the weirs on the River Dodder. Picture by Eleanor Keane. Everyone enjoyed the walk we think, and indeed some said they would join us again. We had about 50 participants and it was great to see a mix of ages. We saw 31 species which was a good number for a two and a half hour walk. Thanks to all who came along with us and we look forward to seeing you all again at future events.